This post is sponsored by Public Bikes. I begged to work with them after I tried their awesome bikes. I’ve wanted bikes since we first moved to San Francisco over 8 years ago. Our first apartment we lived right in front of a Metro stop and it was easy to get around town. We thought about getting bikes but we didn’t have a garage so it didn’t make sense. Then we moved on Nob Hill where we had a storage room but we lived at the top of San Francisco’s famous steep hills so bikes got nixed again. In Paris we used Velib, the public biking system almost every day. So when we moved back to San Francisco we specifically looked for apartments in flat areas so we could get bikes. We test drove bikes last week and placed an order for two bikes and kids seats. 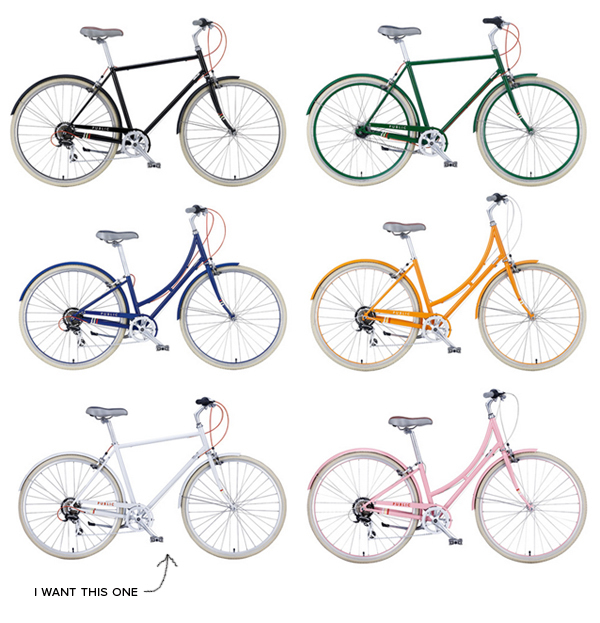 I am so excited to get them, I can’t wait to bike all over the city (the flat-ish areas at least) with the kids. We chose Public Bikes because we wanted classic European style bikes that were good for getting around the city. (I approached them after I test drove and fell in love with their bikes at their new Valencia street shop around the corner from our new apartment.) They come in really clean modern colors and just put out a new line of spring colors. 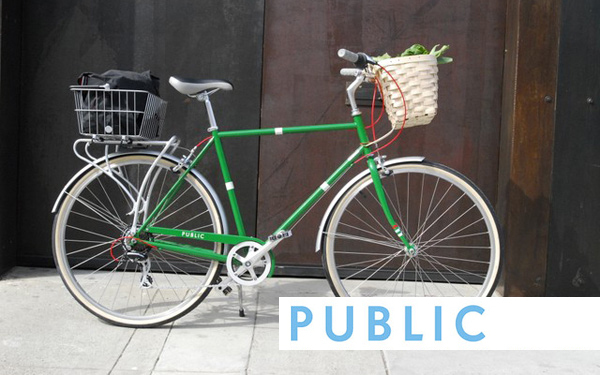 Have you ever tried a Public Bike? ps: Remember Rebecca and Derek’s Bike Wedding? I love these! We live in Chicago and would love bikes to get around, as driving is such a pain and our L system requires a lot of transferring for where we travel to. My one issue is that I’m 5′ tall and I’ve been having a hard time finding a bike that fits right and isn’t crazy expensive. My husband bought me a Public M8 as a gift for graduating law school, and I L-O-V-E it! The internal hub is awesome–if you have that option, you should totally take it. It’s smooth, fast, comfortable. I love love love my Public bike! YAY! i love my public bike! i got the green one in the top picture and have been super thrilled to have it. 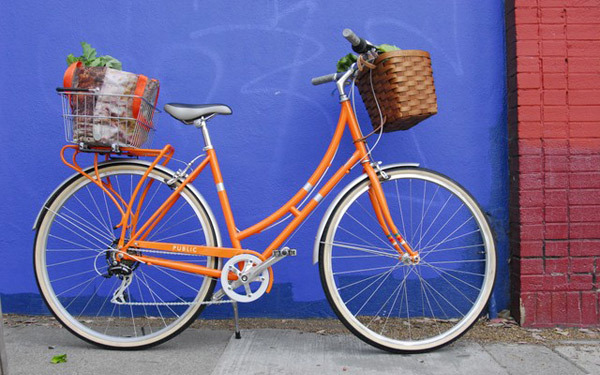 you’ll love your new bike! I love these! I wish I lived in an area where I could ride my bike more often! I really, really want a Public bike. One day! Did you get the kid seats from Public as well? I need a seat for my 2 year old and noticed the Public store during Sunday Streets a few weeks ago, but didn’t even think to check for kid seats there. Will they let you take the seats for test ride? Thanks! we did, I will let you know how we like them. I love these bikes. I am hoping my hubby will get me one for Christmas. Welcome back to the States. Those bikes are feeding my nostalgia! You are so lucky to have tested them. OMG… I love the pink one:) and of course your blog! Cool ideas and themes! i have four kids and wanted to start biking to school and around alot more. I still had two that didnt ride, so I opted for the bike trailer with two seatbelts. its fine for flat, but occasionally I do have to get off and push up inclines around here. Now my 5 and half rides herself so just the 2 year old in the trailer I had to go this route as my husband is always working! Just an idea if you want to ride and are without husband, but it seems that as an artist he has good hours to be home with you? i love my bike! check out my post about pimping my ride i wrote this morning! story, i havent been able to ride my bike since october due to my boyfriend losing my keys and i found someone today who will cut my bike lock and set my little bike free for only $20! i had been calling lock smiths and it was going to cost over $100! oh happy day indeed! Are u going to ride on the roads or sidewalks? You shoul attend a city commission ans ask that they start to focus on bicycle paths and lanes in the city. I told my husband that I wanted a new bike for Christmas this year and he kept telling me that he could refinish an old one for me (he designs and custom builds cars for a living). The debate raged on, but Christmas morning I was so thrilled to see my new/vintage bike! It was especially cool because he used an old bike that belonged to a family member in the 60’s. There are several pictures of the amazing now/old bike on my blog. I am so excited to get to ride it now that the weather is warmer!